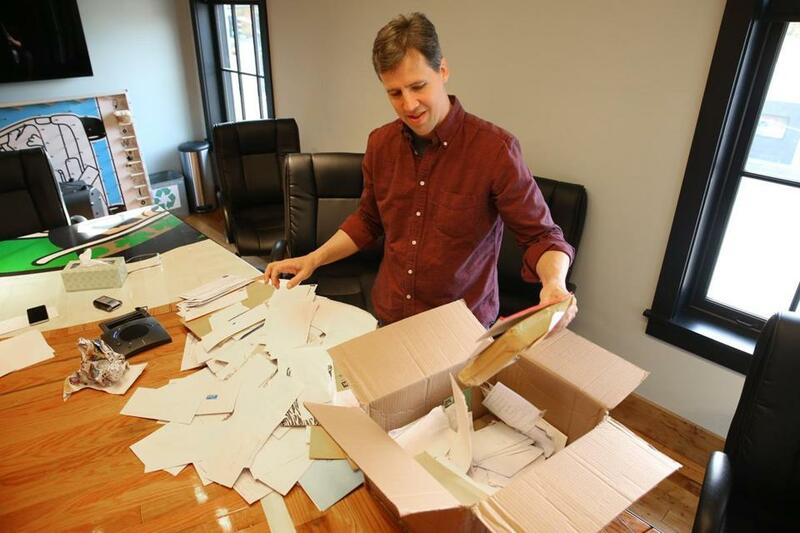 In Plainville, Jeff Kinney looks over a small sampling of the mail he receives from fans of his “Diary of a Wimpy Kid” books. 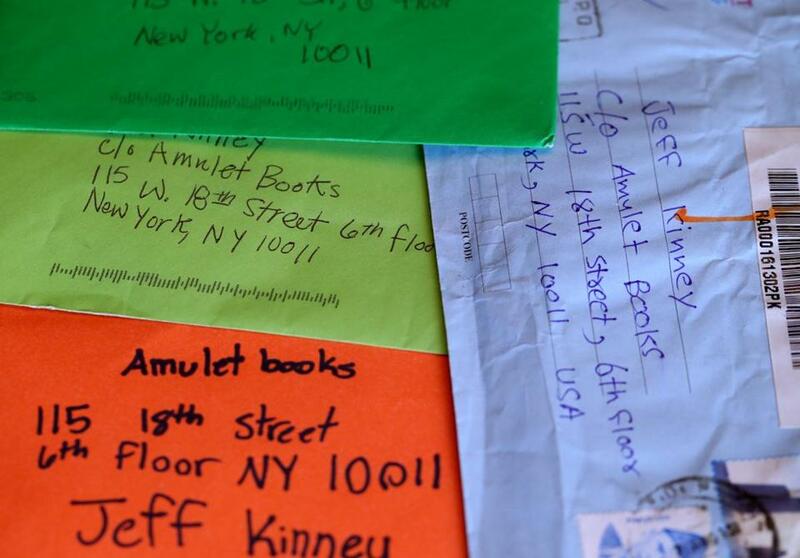 The letters arrive on crinkly notebook paper, addressed to “Jeff Kinney” or “Jeff Kinney, who is an author” or, sometimes, “Jeff McKinney.” They are penned in blotchy marker and crooked, penciled print. Often, they come adorned with stickers or doodles or the crusty remnants of some sort of mystery substance — candy, perhaps, or something more sinister. “I think this one has a booger on it,” said Jeff Kinney. It was a recent weekday afternoon, and Kinney, the man behind the wildly popular “Diary of a Wimpy Kid” franchise, was sitting inside his Plainville bookstore, picking through the latest batch of letters sent from his pint-size legion of readers. As the creator of one of the country’s best-known children’s series (there are currently 164 million copies of his books in print, while the “Wimpy Kid” brand has been valued at more than half a billion dollars), Kinney often finds himself awash in fan mail. A rep for publisher Abrams Books says Kinney receives hundreds, “sometimes thousands,” of letters each week. And with his 10th book, “Diary of a Wimpy Kid: Old School,” now on shelves, the deluge doesn’t figure to slow anytime soon. Which might explain why, when the Globe asked recently to join the author in digging through it, Kinney agreed. The letters’ authors ranged from the emotionally fragile (“Please will you answer personally, otherwise I will be highly upset”) to the inherently skeptical (“Is your name Jeff Kinney or not”) to the brutally blunt (“I am writing this because my teacher said we had to write a letter”). Multiple kids asked whether Kinney wouldn’t mind including them in his next book — a request that Anna Cesary, Kinney’s cheerful and tireless assistant, explained was particularly common. “They’ll say, ‘Can [the character] be named Jacob and have blond hair and be good at soccer?’ ” she says. In an apparent attempt to boost their chances, kids sometimes include gifts. On this day, Kinney received a book titled “Hug Your Customers” and a handmade object built with tinfoil and toothpicks (“I thought you would like it more than me and might enjoy it,” the young sender explained in an accompanying letter). He has also received, at one time or another, candy, money (which, he notes, is always returned), a picture of an owl that lived in one young reader’s backyard, and an offer from a girl whose father worked in the private jet business for a trip anywhere he liked. For Kinney, an online game developer and designer who originally created “Diary of a Wimpy Kid” as an Internet comic for adults, the sheer volume of fan mail has taken some getting used to. Early on, he’d been confident he could respond to all of it on his own — even after the success of the first book in 2007. But then came more “Wimpy Kid” books, then the “Wimpy Kid” movies, and before long, three years worth of unread fan mail had piled up. The mailing info is then passed on to a fulfillment company, which sends out a one-page form letter — each printed on special “Wimpy Kid” stationery and signed personally by Kinney. Even with the current system in place, keeping up with it all can be a daunting prospect. At the moment, the closet in the master bedroom of Kinney’s home is devoted entirely to fan mail, serving as a constant reminder that there are masses of youngsters still awaiting his response. “There are certain closets that I avoid because it’s so upsetting not to be able to respond to these kids personally all the time,” he admits. A reprieve does not appear imminent. 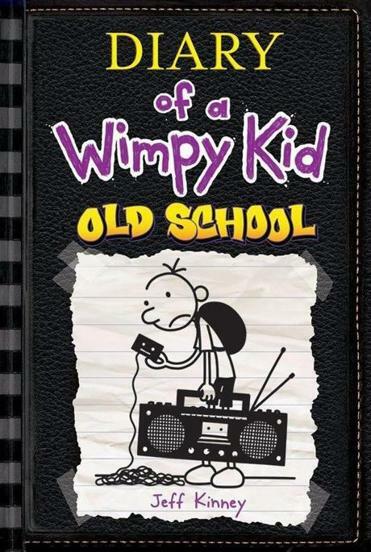 The next year alone could potentially bring an 11th “Wimpy Kid” book, the development of both a “Wimpy Kid” musical and a fourth “Wimpy Kid” feature film, and two animated “Wimpy Kid” television specials. And the children, for their part, seem to have no shortage of time on their hands. He then went on to explain that he would be writing more letters later that day — presumably after he had procured more stamps — and assured Kinney that he could expect to receive them sooner rather than later.